The AICF KIIT Cup , the first of its kind in India , started here on 17th March at the Banquet of Hall of KIIT Campus, Bhubaneswar. 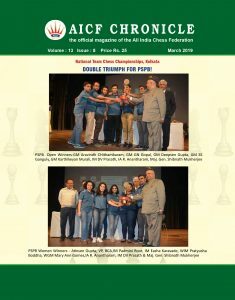 The prestigious event carries a prize pool of Rs.9.20 lakhs is being jointly organized by the All Odisha Chess Association and the KIIT University. The 10 day event Is co sponsored by Oidsha Mining Corporation and is conducted under the aegis of All India Chess Federation. The Category 13 event is conducted in a round robin method with 12 titled players contesting in all play all situation. The foreign participants are quite strong with International Master Elizabeth Paetz of Germany sitting on top with an ELO rating of 2487 and Grandmaster Elina Danielian of Armenia following her with ELO rating of 2466. The Indian challenge is starting from 6th seed to 12th , but looks positive with both IM Eesha Karavade and WGM Mary Ann Gomes possessing a healthy rating of 2387 and much is expected from the local talents of WGM’s Padmini Rout and Kiran Manisha Mohanty. 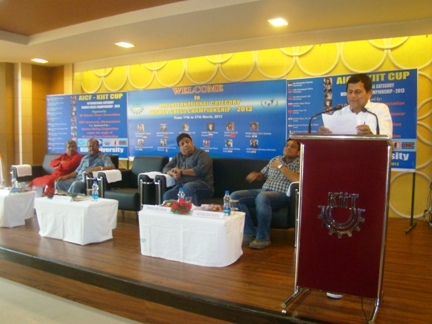 Earlier the championship was inaugurated by Dr Achyuta Samanta in the presence of Sri Sibabrata Dash,IAS,Chairam,Odisha Chess Development Committee , and the guest of eminence Sri Bharat Singh Chauhan , Secretary, All India Chess Federation. The oldest competitor of the event IM Cristina Foisor played a mixture of Kings Indian and Old Indian defense with black pieces against WGM Girya Olga of Russia. Foisor was doing so well that in midway Olga was busy in defending her King side as well as occupying the d6 square .In an attempt to simplify the position the Romanian IM miscalculated the resultant King and pawn ending and lost the game in 56 moves. WGM Mary Ann Games managed to draw despite defending a passive position from as early in the middle game. Mary allowed her Chinese opponent Guo Qi to have a commanding position thro control over the b and e files . In time pressure the Chinese overlooked a capture leading to a mating attack on her king , hence defensive moves were repeated and the game ended in 39 move draw. The game between IM Nisha Mohota and WGM Padmini Rout was an Hungarian treatment of the Grunfeld , with black looking better in the middle game. Frequent exchanges of pieces allowed less chances for a win , resulting in a draw in 48 moves. The first game to finish was between the Armenians IM Mkrtchian Lilit and GM Elina Danielian which ended in a 24 moves draw after black decided to repeat the moves to overcome a pawn deficit from a French defense game. WGM Swathi Ghate posed problems to IM Eesha Karavade from the black side of Bogo Indian game. A pawn sacrifice along the theoretical lines misfired for Eesha allowing Swathi to pressurize on the d file with the extra material. The 40 move in 90 minutes deadline put Swathi on the backfoot preventing her to find a winning way and the much expected repetition of moves came from the opposite color bishop ending. Top seeded IM Elizabeth Paehtz was involved in a long game of 116 moves from the black side of the closed Italian game . The IM won a piece in the opening with early onslaught , but lost some pawns in the process. Paehtz couldn’t break the defense in the Rook Bishop vs Rook endgame and players signed a truce.A worthy half a point for Kiran to start the tournament.